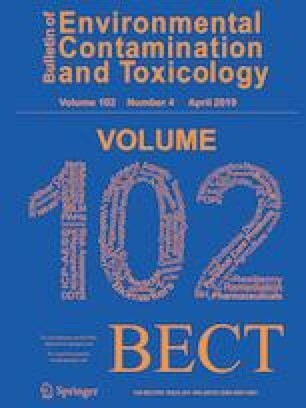 With rapid development of the construction of nuclear power plants along the coast, the concern of negative effects of potentially unexpected release of nuclides on marine organisms has increased. Cobalt (Co) is one of the crucial nuclides in nuclear polluted seawater. The effect of its presence in seawater on life cycle of macroalgae has seldom been studied. In this investigation, a series of Co concentrations including 1, 10, 100 μg L−1, and 1, 10 mg L−1 (the background concentration of Co in culture seawater was determined to be at the level of 0.75 ± 0.11 μg L−1) were used to test the effects of their presence on spore germination, gametophyte growth and gametogenesis of the important brown macroalga Undaria pinnatifida. It was found that the spore germination rate of 10 mg L−1 group was significantly lower than that of the control group after 1- and 2 days exposure. The gametophyte sizes of 1 and 10 mg L−1 groups were much smaller than that of the control group after 6- and 12-days exposure. Oogonia and juvenile sporophytes were observed to appear in 1, 10 μg L−1 and the control groups after 12 and 15 days, respectively, but not in the higher concentration groups. In the recovery test, sporophytes appeared in the 100 μg L−1 group on the 5th day, but not in 1 and 10 mg L−1 groups. These results demonstrate that presence of Co at high concentrations in seawater disturbs the life cycle by suppressing both the gametophyte growth and gametogenesis in U. pinnatifida. This research was supported by grants from the State’s Key Project of Research and Development Plan (Grant No. 2016YFC1402507), National Key Technology Support Program (Grant No. 2015BAD13B05), China Agriculture Research System (CARS-50), the Taishan Scholar Program of Shandong Province and the Foundation for Huiquan Scholar of Institute of Oceanology, Chinese Academy of Sciences.